André* dreamed about it… a Grand Tour of the Mediterranean to gather the nectar of its many fruits. Crossing the mountains in a single stroke from Die to Genova, via the maritime Alps, he would then have started off on other paths in other mountains. From the Julian heights to the great passes of the Atlas, via the sacred summits of Greece, the Anatolian hills, the Krak of the Crusaders and the Chebika oasis. Without forgetting, of course, his dear Corsica, a mountain cast off among the waves of Mother Mediterranean. In fact, André Pitte did go on his grand tour, but as an immobile voyager, small bit by small bit in real life. A wonderful text. 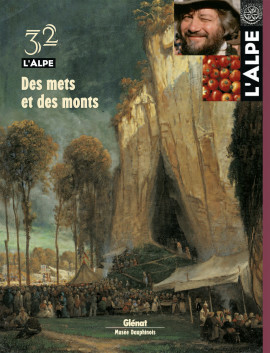 * André Pitte, founder and publisher of L’Alpe, 1942-2006 . A land can be seen… and tasted. An idea that did not cross the minds of the first Alpine tourists. Long looked down upon, local dishes were finally rediscovered less than a century ago. Used as tourist attractions, the recipes were arbitrarily codified. Those standardisation efforts are now being contested by a new local cuisine this is delving into the old family recipes. To preserve summer products and not find themselves with nothing to eat when the North wind begins to howl and the snow to fall, farmers and particularly mountain folk have, like the ant in the famous tale, shown great ingenuity in conserving food. Many and varied, the techniques have evolved with each culture and the available food stuffs. Fairs and markets play a central role in Alpine societies. Far from being limited to cities, these predominantly rural events have for centuries maintained a dense network of relations. Places to do business and meet, they have provided mountain inhabitants with access to European economic and cultural life. In Savoy, one could find living carps on markets, carried by mules from the Dombes ! Highly appreciated, carps were raised in great numbers in the many ponds of the area and for centuries generated profitable trade with neighbouring regions. Depending on the year, inhabitants harvest carps or grain in the Dombes, a surprising area moulded by the Alpine glaciers. Wading in the mud and water can be pleasing work when the nets are so full ! In Switzerland, the culinary heritage lies at the heart of a great inventory project. Surveys have already listed hundreds of traditional specialities, whose great variety bears witness to the mixing of populations. An integral part of the country’s cultural heritage, the many dishes are the subject of a fascinating study. A quick taste as an appetiser ! Photographer Liberto Macarro sees mountains where others see cows ! Probably because the product of the two, the animal in intimate contact with the land, is one of the greatest cheeses in the world, the Beaufort. A particular vision that fulfils the senses. The endless increase in transport capacity results in strawberry yoghurts travelling a total of 9 000 kilometres to reach our tables. In response to issue 29 from last fall, here is a scathing critique of an absurd transport system by an advocate of local use of local products. In western China, not far from Tibet, lies a high mountain chain, considered the origin and centre of the world in Chinese mythology. An endless source of life due to the rivers springing from its flanks, the Kunlun is also home to the wonderful orchard of Xiwangmu, the queen of the immortals.